Mix Oatmeal, rawa, maida and rice flour along with salt and add enough water to make a thick batter. Add chopped onion, curry leaves and green chillies to the batter. Heat tawa. Wipe it with oil. Pour one big ladle of batter in the tawa and spread it. Pour a teaspoon of oil around the corners of the dosa. After it cooked oneside, flip it over and cook other side also. Remove it. Tips:You can make this dosa with left over ordinary dosa batter also. For one cup dosa batter, add one cup oatmeal along with a pinch of salt and mix well. Make dosa as above. What a wonderful recipe!! And such a quick preparation! I am awed by your recipes. Thanks very much. I am trying out your recipes one after another and they are turning out to be very good. Thank you for visiting my site. I have already posted vatha kuzhambu and curry leaves chutney etc. Please check the same by visiting my home page. You have a very nice website :)I have a quick question – is the oatmeal to be cooked beforehand ? Thank you ! No need to cook oatmeal. Oatmeal is pre processed one and just mixing with water is enough and it will get cooked when you prepare the dosa. However, if you use oats, then just fry the same in a dry kadai and powder it. Then use it. your blog is so good that you have show many varieties and variations. Thank you for visiting my site. Nice to hear that you tried this dosai and liked it. I tried so many recipes from ur blog.Every recipe is a success.Ur blog is equal to my moms recipe book now.It would be helpful if u can add some baby and toddler recipes like sathumavu etc. 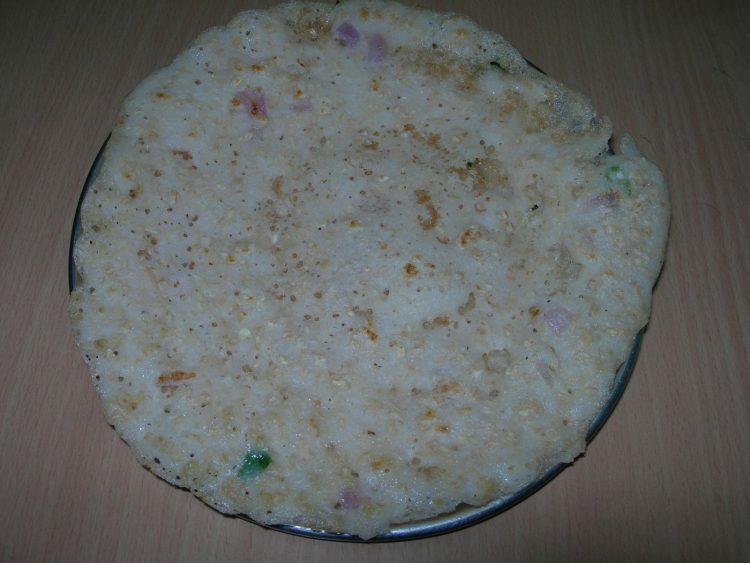 i m first time visitor of ur site… i wanted to prepare something diff and quick… just saw this… never tried oats for adult… so thought of trying … really it came out so good… replying u while taking dosa…. thank u so much of healthy n tasty reciepe…. Welcome to my site. Thank you for your kind comments. Thank you Angel Stephen for your kind words. hi mam,can we prepare the dosa immediately after preparing the batter?or should we keep aside the batter for some time? You can make it immediately like rawa dosa – no need for fermentation. Today i tried ur oatmeal dosa. Came out well. Every body liked it at home. Thank you so much.